Win A Gift Card! Our Christmas Contest Has Begun! Our Christmas Contest Has Begun! 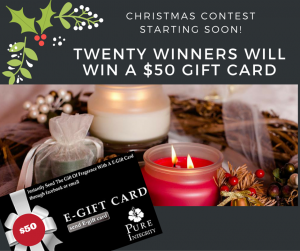 We are so excited to giveaway Twenty $50 gift cards! Giveaway starts today November 25, 2015 and ends on December 22! I can’t wait to try your candles!! I’m hoping I can get them just before Christmas. Bummer I missed the contest, I so would have used that here, great place! On 12/23/2015, I visited the store and spent $100 for about 6 candles. They are awesome. I have recommended this store/website to at least 25 of my friends. The candle scent and burning is awesome, no wax left on the side of the jar. The jar and top to the jar are outstanding too. Staff at Pure Integrity are fun too. Keep it pure, love it! I really wish I would have won this for my girlfriend!